I always like to think of myself as an expert on pitchfork-waving horrors of the 60s and 70s, but Cry of the Banshee has always passed me by - probably because the common opinion is that the movie just isn't very good. Anyway, I've bitten the bullet and finally gone in - and you know what? It ain't bad at all. Ok, it's no classic and anyone expecting another Witchfinder General will be sorely disappointed - Gordon Hessler's take on witchcraft in the middle ages isn't a patch on Michael Reeves' masterpiece. But it certainly has its moments. Vincent Price is on-hand again to offer up some menace, this time as local landlord and magistrate Lord Edward Whitman. He likes to arrest and torture witches (as you'd expect) and generally put himself about as a nasty piece of work, aided by his equally-nasty son and a couple of thugs. 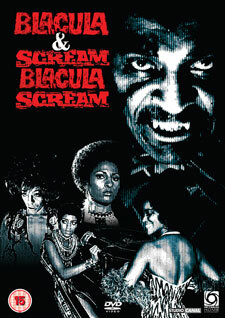 During the sixties Roger Corman directed and produced a lot of terrific horror films based on the work of author Edgar Allen Poe, but one of his best films borrows its story from the work of H. P. Lovecraft. During its initial release The Haunted Palace was advertised as being a "Poe" film in order to attract the same audiences that had enjoyed Corman's earlier movies, but The Haunted Palace is actually based on Lovecraft's story The Strange Case of Charles Dexter Ward. In The Haunted Palace Vincent Price plays Charles Dexter Ward and he delivers one of his most complex and chilling performances in the film. The Haunted Palace is often overlooked in favor of Corman's Poe films, but that's a shame since it's one of the directors most interesting and creepy efforts. The original DVD is currently out-of-print and used copies fetch a high-price on Amazon . Hopefully a new DVD of the film will be made available soon. In the meantime you can enjoy the original trailer for the film posted below. 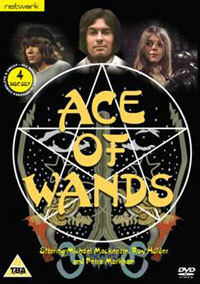 For fans of quirky early 70s children's TV, here's some good news - Ace Of Wands is finally arriving on DVD on 9th July 2007. If you missed it or (like me) are too young to remember it, Ace Of Wands was a typical hippy throwback series covering the adventures of a magician (Tarot - played by Michael MacKenzie), using his powers to figh crime and evil forces, accompanied by the obligatory companions. Sadly, the first two series of the show are believed wiped, but this DVD features all of series three (20 episodes), so you still get plenty for your money. Extras include a new documentary about the show, an image gallery and scripts. The four-disc set will retail for £39.99. 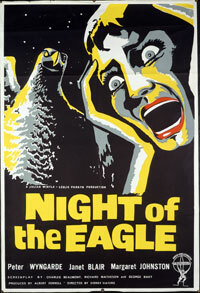 We mentioned earlier this week that creepy Brit flick Night of the Eagle (also known as Burn, Witch, Burn!) was returning to DVD, so a good chance to feature its very cool cinema poster. And I wish I knew more about it - and indeed the person that created it. Much more artistic than the majority of cinema posters of the era, the stylised image and quirky font are still incredibly eye-catching today. However, as it's not really an obvious cult movie, you should be able to pick one up fairly cheaply (as vintage film posters go) for around £250 - maybe less.